The Ethiopian Airlines pilot of the jet that crashed, killing 157 people, had reported flight-control problems, the company said on Wednesday as it prepared to send the black boxes to Europe from a disaster that has rocked the global airline industry. The Boeing 737 Max 8 went down six minutes after takeoff from Addis Ababa en route to Nairobi, killing everyone on board, including 18 Canadians. The investigation may focus on an automated anti-stall system that dips the aircraft’s nose down. opposed to external factors such as birds — and had requested to turn back to Addis Ababa. The airline’s CEO had previously said the pilot sent out a distress call, but did not provide further details. Begashaw said a decision where in Europe to send the black boxes would be taken by Thursday. Authorities in France and Britain said they had not been approached yet. 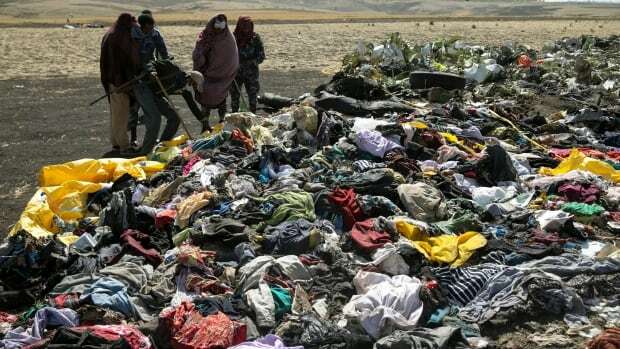 The still unexplained crash followed another disaster involving a Boeing 737 Max 8 in Indonesia some six months ago that killed 189 people. Though there is no evidence of links, the twin disasters have spooked passengers worldwide and triggered a global backlash against the 737 Max 8 aircraft, with about two-thirds of the fleet grounded by aviation authorities or airlines, in spite of assurances from Chicago-based Boeing and the U.S. Federal Aviation Administration. Boeing reiterated that the investigation into the crash remains in its early stages and it has no basis to issue new guidance to operators. The U.S. aviation regulator said it would not ground the planes, and a review “shows no systemic performance issues and provides no basis to order grounding the aircraft,” but will “take immediate and appropriate action” if issues are identified. Canada and the United States are among the few remaining operators of the plane after India, Thailand, Egypt, Lebanon, Kosovo and Hong Kong on Wednesday became the latest countries to ban the Max 8 from their airspace, joining the U.K. and the entire European Union, among others. In October, the same model crashed in Indonesia minutes after takeoff, killing 189 people and sparking concerns over automated flight systems. Begashaw said the Ethiopian Airlines pilot had been trained on the plane after the October Lion Air crash. Begashaw said the airline would consider whether to proceed with an order for more 737 Max 8s after the preliminary investigation. Boeing has nearly 5,000 more on order and says it plans to update the software in coming weeks. In November, two incidents were reported to the NASA-run Aviation Safety Reporting Database that involved problems in controlling the 737 Max at low altitude just after takeoff with autopilot engaged, according to documents first published by the Dallas Morning News and verified by Reuters. “We discussed the departure at length, and I reviewed in my mind our automation setup and flight profile, but can’t think of any reason the aircraft would pitch nose down so aggressively,” one pilot said. Boeing did not respond immediately to a request for comment, but it has previously said it provided appropriate information to pilots to use an existing procedure to handle the issue of erroneous data affecting the anti-stall system.